The ribbon cable is one of the defining characteristics of the difference between the Ghostbusters and Ghostbusters 2 proton packs. Ribbon cable is a cable with many conducting wires running parallel to each other on the same flat plane. It is rainbow ribbon cable due to the many different colors of wire used. 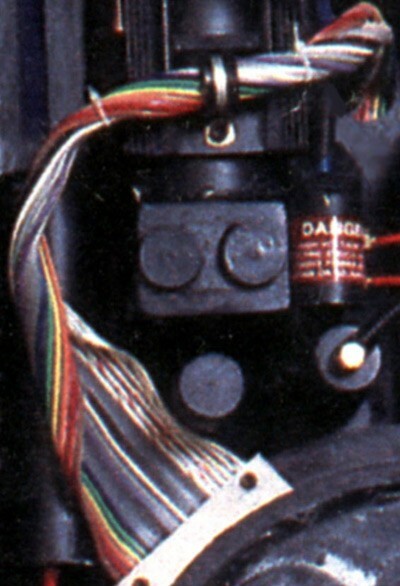 On the proton pack, the ribbon cable runs from a clamp on the top left side of the cyclotron and twists around itself, is clamped on the booster frame and feeds and disappears into the cosmetic plating below the gear box/crank generator. It is probably one of the most eye-catching features on the proton pack. The ribbon cable used in Ghostbusters has yet to be located. It is currently one of the most sought-after pieces, because its discovery will allow builders to start making packs screen-accurate to the first movie, rather than the second. There are only a few photos that show enough detail to actually see the cable. Some believe it is a fabric and wire combination, or that the wires were custom-made only for the movie. 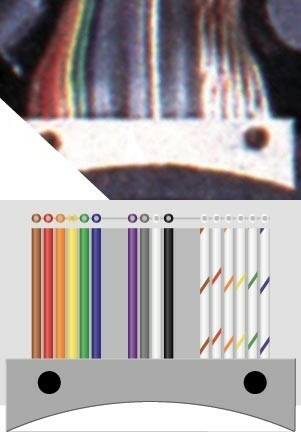 The ribbon cable on the proton packs in the second movie is made by Spectra Strip. It is still being made with the correct number of wires, 30 pairs (60 wires total). It is model #132-2801-060 and is readily available from many surplus stores. On the correct ribbon cable there is a 2-3" section of the ribbon cable that is not twisted at all. This part is usually concealed inside the curl and wrap of the ribbon cable as it goes into the cable clamp. There are alternatives out there that do not have the straight section, as well as others that have fewer wires and/or different colored wires. Black - Brown - White - Brown - Grey- Brown- Purple - Brown - Blue - Brown - Green - Brown - Yellow - Brown - Orange - Brown - Red - Brown - Darker Brown - Brown. Repeat that pattern a total of 3 times, until you have 60 wires total.